you to discreetly express your individuality. Our consultants make a personalised assessment of each and every client, noting intricate measurements, lifestyle choices, habits and individual characteristics, so as to project each client’s personality onto his attire. A Camessi Bespoke masterpiece is a labour of love, one that is a sheer joy to slip into. After all, feeling good is the first step towards looking good. 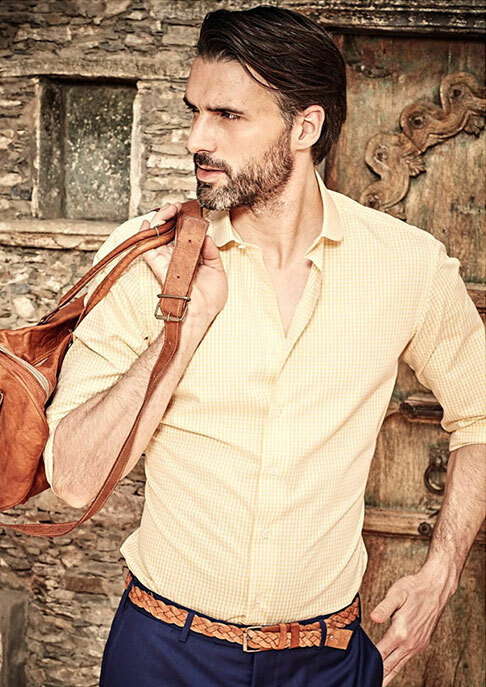 A signature Camessi Bespoke Shirt assesses the best in a man and translates it onto cloth. Our exquisite craftsmanship, averaging 23-24, virtually invisible stitches per inch, results in a seamless finish. Narrow hemlines (3mm) and side French seams give a cut and fit that lend you a distinguished look. Precious mother-of-pearl buttons, flawlessly sewn onto the shirt, allow for elegant and easy buttoning. Encased in this embodiment of sartorial excellence, you find yourself exuding the finesse you always possessed but could never display. The Camessi Bespoke Trouser represents an unlikely, albeit perfect, marriage between art and science. Assiduously handcrafted buttonholes, manually pick-stitched seams and hand-turned hems find their way into a product that undergoes the most rigorously designed quality inspections; inspections that are often touted as unviable for a made-by-hand product. The perfect companions to the Camessi Shirt, these hand-tailored wonders are crafted entirely to your fancy. The Camessi Experience begins with a visit by our bespoke consultants. No detail is too small. Preferences, lifestyle and habits all matter. Every body has a unique form. Our consultants expertly record fifteen distinct measurements for the pattern-making process. An eclectic collection of fabrics woven from the finest natural fibres fulfills the needs of even the most persnickety gentleman. Choose from our in-house creations or use your imagination to cut your own. Master tailors hand draw and cut a unique paper pattern that will be preserved for posterity. A broadcloth fitting-garment marks the first step in the trial process. The consultants observe and rectify any shortcomings of fit. If necessary, a new fitting garment is constructed. If not, the bespoken Camessi shirt or trouser is delivered within two weeks. We offer service where measurements and trials can be taken in the comfort of your own home. Please feel free to fill the form below to book an appointment with us. Thank you for booking an appointment with us. We will get in touch with you shortly. Error in Booking an Appoinment.